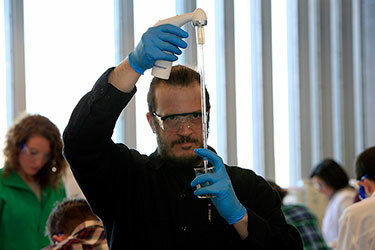 CCRI’s Biotechnology program includes courses in biotechnology, microbiology, chemical technology and instrumentation. Coursework is designed to mirror many of the concepts and techniques used in biotechnology and related industries. In addition to coursework, students will have access to industry professionals through classroom speakers, manufacturing facility tours, industry seminars and professional networking. The Biotechnology program offers hands-on, competency-based instruction designed for entry-level students or retraining for individuals with previous workplace and/or educational experience. The 18-credit certificate program focuses on the techniques and skills leading companies look for in the area of biomanufacturing. Biotechnology certificate credits can be used toward the completion of the Science track leading to an Associate in Science (A.S.) degree. This allows students the option of working in the biotechnology field while completing their degree. Alternatively, students can complete the Associate in Science degree and the Biotechnology certificate program concurrently. For more information, see the “Science” track entry in the catalog or contact Program Coordinator Scott Warila at 401-825-2136 or srwarila@ccri.edu. Additional information is available through the Biology Department on the CCRI website. Note: Students are required to receive a grade of C or better in the courses required for the Biotechnology certificate or obtain special permission from the program coordinator. Many courses require prerequisites, corequisites and/or testing. See course descriptions for details. Most students in this certificate program attend part time and take two courses each semester. Therefore, the average time to complete the Biotechnology certificate as a part-time student could be three semesters (or 18 months). Students who choose to attend full time could complete this certificate program in as few as two semesters (12 months). For more information about the number of CCRI graduates in this program and other important gainful employment information, please visit www.ccri.edu/acadaffairs/gainful-employment/bst/biol/biotech-cert.html.